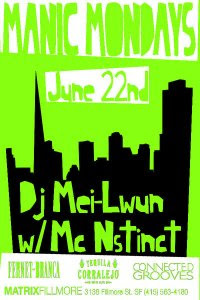 MLNP: A bunch jumpin off for summer in SF!!! Manic Mondays June 22nd W/MC NSTINCT!! 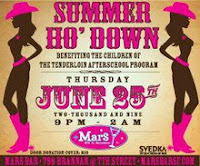 The HO Girls are back to help raise money for the Tenderloin Afterschool Project. 20 of San Francisco's HOttest girls (and a couple HOnorary boys to boot) are gettin' their cowboy boots on to start up some fun that Thursday night at Mars Bar. Musical guests this year are DJ MEI LWUN, LUKE FRY & D MFR. its my first time since @ 5A5. Of course me and the wifey have mad history in that building as Frisson so this should be fresh!! MLNP presents a casual take on one of SF's nicest venues, SLIDE. 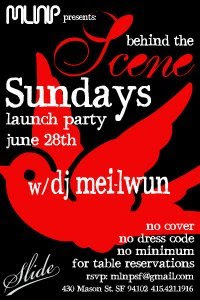 Will you be "Scene" every Sunday with the behind the scenesters of San Francisco letting it all hang out. Come as you are dress code and No minimum for table reservations make this Sunday a no brainer. 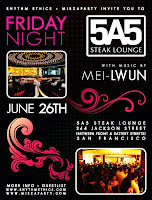 Get a few friends together and reserve your table now by emailing mlnpsf@gmail.com.